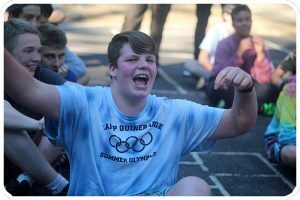 Over the past 80 years, Camp Quinebarge has been known as the Best Coed Summer Camp in New Hampshire because of its community based environment, freedom to choose your activities and Monkeytown, USA! Campers have described Quinebarge as the most accepting community and have developed everlasting friendships from Camp. At Quinebarge we have 3 meals a day and at those meals we let our campers decide where they would like to sit. Campers continually say how much they love the freedom to be with their friends both at meals and throughout camp life. 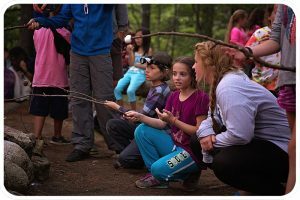 Our expertly trained staff facilitate these relationships and encourage the freedom of choice throughout our campers stays. 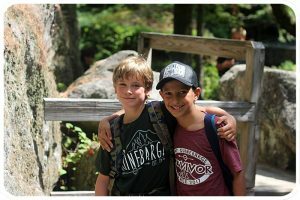 One of the benefits of this approach is that campers get to know everyone at camp no matter what age or gender. All of our activities are camper based instead of cabin based. 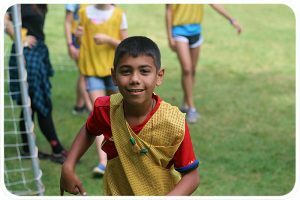 Campers get the freedom to sign up for activities that they want to do. These activities include boating, sports, adventure (ropes course), hiking, arts and crafts, and nature. Our activities are mixed between ages, with boys and girls participating together. We are constantly getting feedback from our campers that they like this aspect of camp the most because they get to meet everyone at Camp. We also have an All-Camp Swim everyday at Camp. This is a fun time for everyone to cool off and hang out! Monkeytown, USA is Camp Quinebarge’s homegrown village and activity area. Since 1940 Quinebarge has elected a Monkeytown mayor, printed our own money, held Monkeytown Carnivals and Olympics and more. At times we even call out the Monkeytown Bureau of Investigation. Monkeytown is an actual place, a series of tree-platforms we use for our Carnival, sleep outs and other fun times. Come experience Monkeytown this Summer!! !